Subconjunctival (sub-con-junc-ti-val) haemorrhage (bleeding) is a common cause of a red eye. It happens when tiny blood vessels between the clear surface (the conjunctiva) and the white of your eye (the sclera) burst. It's harmless, although it can look alarming. Subconjunctival haemorrhage doesn't hurt, and it doesn't affect your vision. It doesn't need treating and will usually clear up by itself in about two weeks. blood clotting or other blood disorders. If you keep getting subconjunctival haemorrhages, or you get one and you haven't had your blood pressure checked recently, it's a good idea to see a doctor. You should also see a doctor if it's happened after an eye injury, or if you have bruising or bleeding somewhere else on your body. Other things can cause red eyes as well, so if you aren't sure what's causing it, see your GP or optometrist to get it checked. American Academy of Ophthalmology – What is a subconjunctival hemorrhage? 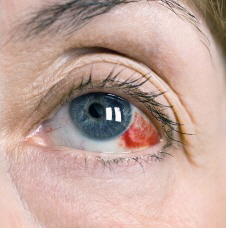 Information about what causes subconjunctival haemorrhage. This site refers to the American health system – in New Zealand, you'll see your GP if you're worried, not an ophthalmologist. More information about what causes subconjunctival haemorrhage, who's more likely to get one, and when it might be more serious. Written by HealthInfo clinical advisers. Endorsed by Canterbury optometrists and clinical director, Ophthalmology, Canterbury DHB. Last reviewed April 2018.